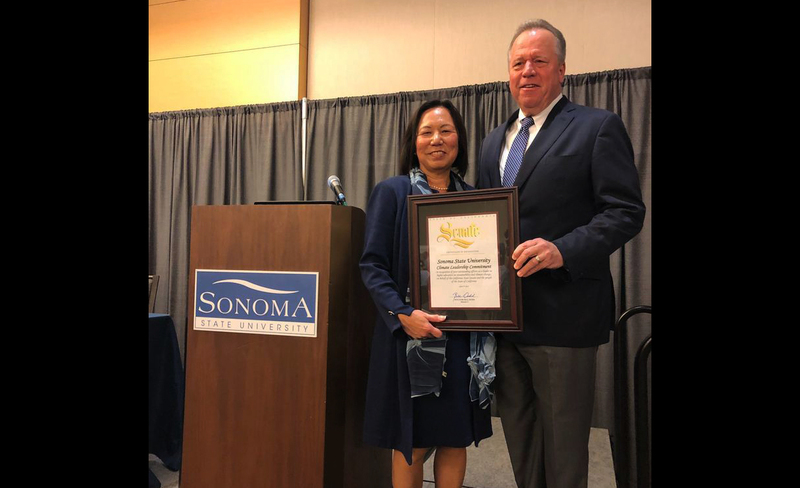 President Judy K. Sakaki receives a Senate Certificate of Recognition from state Sen. Bill Dodd, D-Napa, who was the keynote speaker during the 14th Annual Sustainable Enterprise Conference Friday. 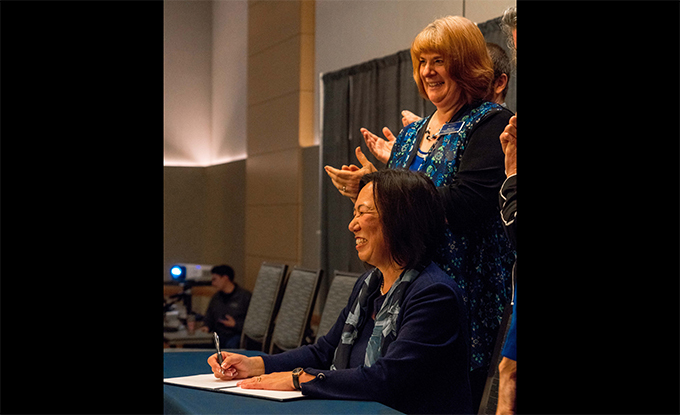 (Rohnert Park) – Before a crowd of nearly 300 people, Sonoma State President Judy K. Sakaki on Friday signed the landmark “President's Climate Leadership Commitment," a comprehensive roadmap for mitigating and adapting to a changing climate, one that sets high goals of sustainability for the university. 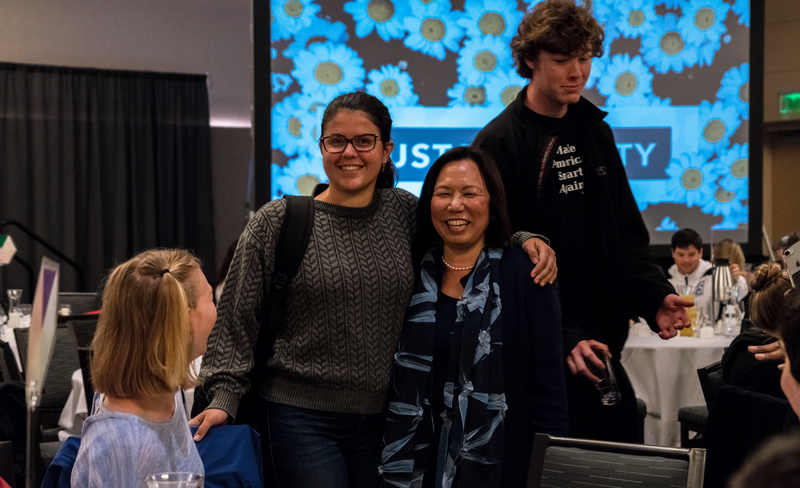 In addition to achieving new standards for sustainability on campus, “we need to stay committed to the curiosity, to the ethics and to the drive that have generated the sustainable solutions we’ve created so far,” she said. 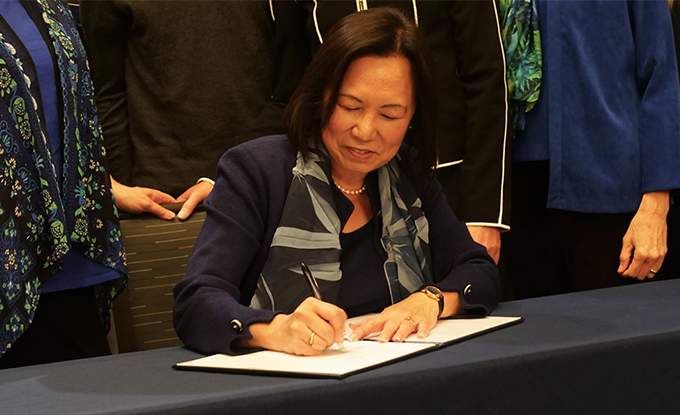 Moments later she put her signature to the Climate Leadership Commitment, a document first adopted by 12 universities in 2006. With leaders from the student body, campus and the community behind her, Sakaki then raised her hand in celebration. “Let’s get started,” she said as the room erupted in applause. 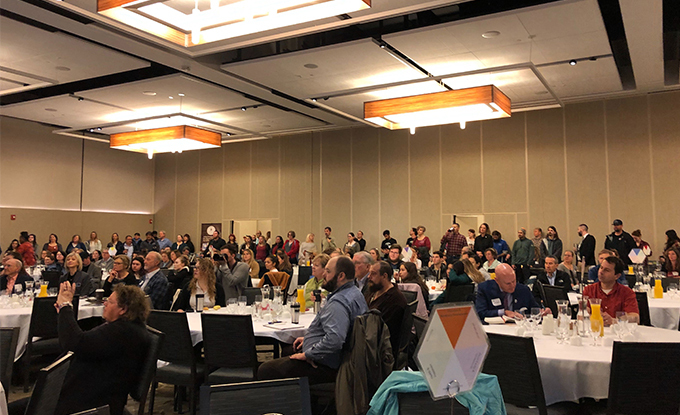 Claudia Luke, director for the Center for Environmental Inquiry at Sonoma State, explained to the audience that the university is committing to carbon neutrality and to collaboratively building resilience in face of climate change. But more than anything, she said, it is making a commitment to students. “We are committing to teaching skills and creating experiences that you need to build successful careers in a time of unparalleled change,” she said. Under the principles of the agreement, the university will be pledging to adopt a Climate Action Plan that calls for achieving carbon neutrality for electricity-powered campus operations by 2045. 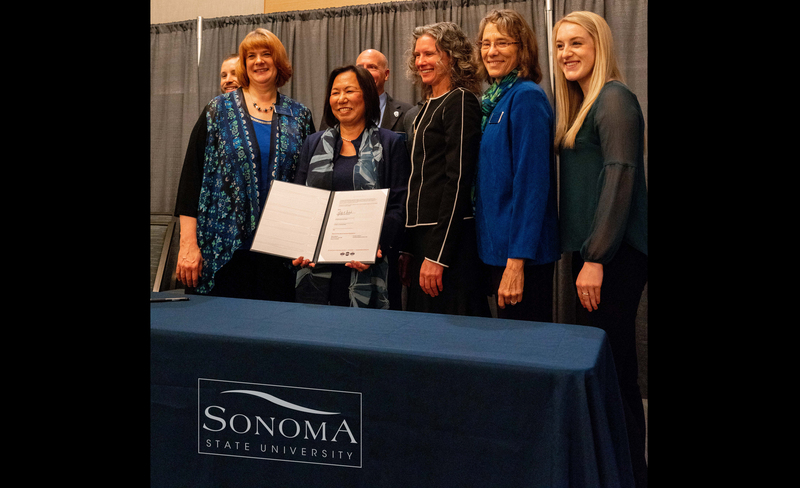 The commitment also calls for integrating sustainability and resilience into curriculum and research while setting target dates for completing a baseline inventory of Sonoma State's carbon footprint by year one and writing a Climate Action Plan by year three.